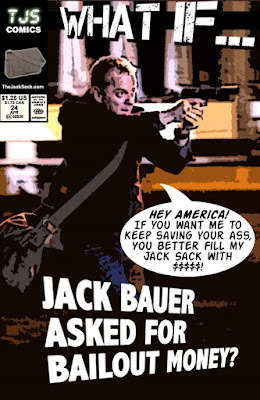 The Jack Sack™: What If... Jack Bauer Asked For Bailout Money? I think I need a break from reading the news. 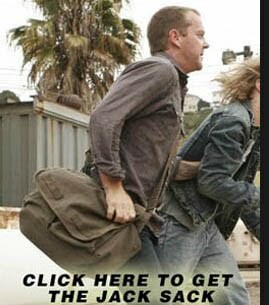 "Fill my Jack Sack..." Hahahaha! Jack don't need no stinkin' bailout! The very thought of this is preposterous. Jack saves us purely for love of country. All we have to do is keep the ammo coming. Crackle- the very idea of most bailouts is preposterous! It takes a visual example like this one to illuminate that fact. Unfortunately we're becoming a nation born without boostraps. what season is that picture of the jack sack from? Season 5, Dancing Pete! (Where Jack and Henderson went to the shipyards).